Getting your kids to fall asleep in the same room is a challenge. Even though you are tired and ready for bed, usually our kids aren’t catching on. 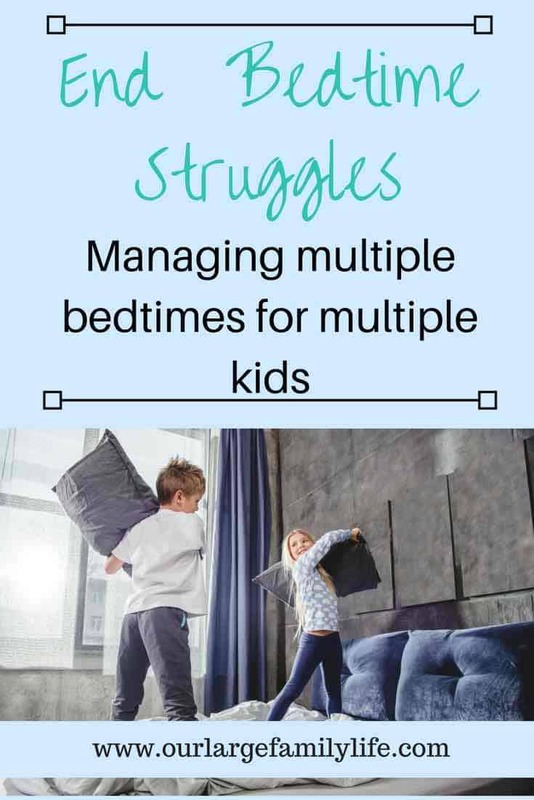 More often than not, you probably look at the clock, realize it’s time for the kids to go to bed and rush them to do pajamas, brush teeth, and hop in bed. And that’s when it starts….. It seems that when multiple kids share a room, instead of everyone laying down quietly in their beds, they keep each other awake. You end up frustrated after you continually get them back in bed telling them to be quiet and go to sleep. By the time everyone has finally calmed down and gone to sleep you are barely keeping your eyes open, and have lost that quiet time you were waiting for. Bedtime doesn’t sound so great anymore, right? Over the last 14 years of children, 10 in which rooms have been shared these are the different methods we’ve used to get multiple kids to sleep when they share rooms. 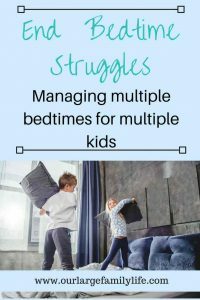 Bedtime Routine Tips For Multiple Children. Start your bedtime routine as soon as possible. The number one stressor to a bedtime routine is not having enough time. When you come home later in the evening or even past bedtime, you are already tired and ready for bed. Trying to get all the kids’ stuff put away, pajamas on, teeth brushed, and whatever else your bedtime routine includes falls apart. The best thing you can do to make bedtime go smoothly is to start it as soon as possible. That may mean leaving friends houses’ or events earlier than you would like. It may mean cutting down on evening activities so you can be home. 1. You get to spend some quality time together. Maybe you had a busy day or a bad day, or you didn’t see each other very much. Reading gives you that time to reconnect before they go to sleep. 2. It calms them down. If we don’t really have a plan for the evening, my kids will tend to run around, a lot. Then I try to put them to bed and you can guess how well that goes. Getting them calm before they go to bed allows them to relax from their day and signal their bodies that it’s time for bed. When you have a lot of little kids sharing a room, one of the best things you can do is to stagger their bedtimes. Again, leaving enough time comes in to play here, it’s hard to stagger bedtimes if you are getting home past their bedtime. And it can get not so pretty. Assuming you have the time, figuring out a way to stagger who goes to sleep first, can be really helpful. Right now, our 3 girls share a room. The 3-year-old goes in first. She doesn’t nap anymore, so it usually doesn’t take long for her to fall asleep. Then the 9-year-old goes in and goes to sleep. The 2-year-old goes in any time after the 9-year-old because the 9-year-old knows not to talk to her, and the 2-year-old can’t see her on the top bunk bed. Experiment with what works well for your family, and your children and how they respond to each other. This is a mother’s worst realization: when kids are ready to lose their naptime. I have not hit the jackpot with naptimes with my kids. Besides 1 child, all of my kids so far have been done with naps by the time they hit 3. Which means if we are going with that data, in less then a year there will be no naptimes anymore. Anyways, with my kids, once they got around the age of three, we discovered that if they napped they would be easily up past 10. They just weren’t tired when everyone else went to bed, which meant they kept everyone else up as well. While giving up naps is painful, it is also really nice to have kids fall asleep right away at night. Right now both of our kids’ rooms have cd players in them. Having music on is a nice way for them to relax. We also keep the music pretty soft so if they want to listen they have to be quiet in order to hear it. This is also a good plan if you have kids that are scared at bedtime. I’ve found they have a much easier time falling asleep when music is on. You will know your child the best to know if this is something they can handle. Sometimes we allow older kids to read in their bed while a younger sibling falls asleep. It’s also something they can do when they aren’t quite ready to sleep, but you still want them to be doing something calm. Children sharing a room does not mean bedtime struggles have to be a part of everyday life. Finding a rhythm that works for your family will allow everyone to have a peaceful bedtime experience. Making sure you have plenty of time, and a consistent routine will allow your children the time they need to wind down from the day. Don’t be afraid to try different things to find what works best for your family. Do your little ones need help remembering your routine? Grab this free Bedtime Routine Chart to help them know what to expect! How do you handle multiple ages sharing a room?